Biomarkers predicting treatment response to the monoclonal antibody cetuximab in locally advanced head and neck squamous cell carcinomas (LAHNSCC) are lacking. We hypothesize that tumor accessibility is an important factor in treatment success of the EGFR targeting drug. 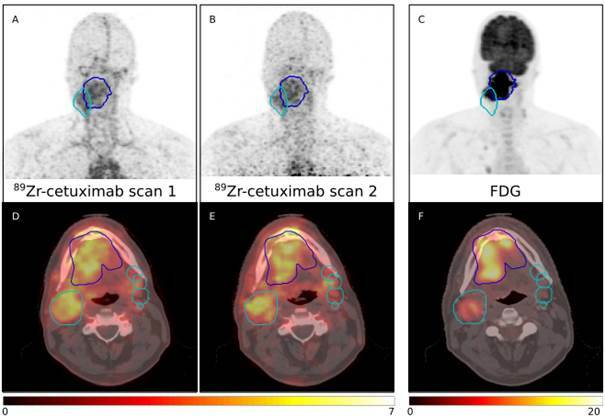 We quantified uptake of cetuximab labeled with Zirconium-89 (89Zr) using PET/CT imaging. Seventeen patients with stage III-IV LAHNSCC received a loading dose unlabeled cetuximab, followed by 10 mg 54.5±9.6 MBq 89Zr-cetuximab. PET/CT images were acquired either 3 and 6 or 4 and 7 days post-injection. 89Zr-cetuximab uptake was quantified using standardized uptake value (SUV) and tumor-to-background ratio (TBR), and correlated to EGFR immunohistochemistry. TBR was compared between scan days to determine optimal timing. Uptake of 89Zr-cetuximab varied between patients (day 6-7: SUVpeak range 2.5-6.2). TBR increased significantly (49±28%, p<0.01) between first (1.1±0.3) and second scan (1.7±0.6). Between groups with a low and high EGFR expression a significant difference in SUVmean (2.1 versus 3.0) and SUVpeak (3.2 versus 4.7) was found, however, not in TBR. Data is available at www.cancerdata.org. In conclusion, 89Zr-cetuximab PET imaging shows large inter-patient variety in LAHNSCC and provides additional information over FDG-PET and EGFR expression. Validation of the predictive value is recommended with scans acquired 6-7 days post-injection. Examples scans for four patients are provided. All patients received a planning PET/CT and two 89Zr-cetuximab scans. Patient P0037C0006I4475579 and P0037C0006I5879176 underwent 89Zr-cetuximab scans at 4 and 7 days post-injection; patient P0037C0006I6042760 and P0037C0006I8991415 at 3 and 6 days post-injection. All 89Zr-cetuximab PET scans are corrected for attenuation, scatter and 89Zr decay.